How much do you spend each month on ink and toner cartridges? How many hours a month do your staff spend fixing paper jams or on the phone to support staff? These are just a few of the questions you should be asking yourself when thinking about your current print solution set-up. This article is going to outline the managed print services benefits. Many companies are unaware of their printing costs, yet it is estimated that printing can cost as much as 15% of a business’ annual outgoings. Companies without a Managed Print Service (MPS) will spend huge amounts of money on purchasing toner cartridges, paying for individual engineer visits, and their staff will undoubtedly spend vast amounts of time troubleshooting printers, resolving faults and sourcing and purchasing supplies. By going down the Managed Print Service avenue, companies gain greater visibility and control over their printers. Whether you are embarking on your first Managed Print Service contract, or moving to a new Managed Print Service, Midshire’s top 12 benefits of an MPS should help you understand the service and the additional benefits a Midshire Managed Print Service provides. By consolidating devices from multiple printers or separate scanners and copiers into fewer strategically placed multifunctional devices, companies save money on consumables and electricity consumption. A Managed Print Service provider such as Midshire, is able to procure toner at a much more competitive price than purchasing ad-hoc items from either a high-street stationers or via an online vendor. This can also be very time consuming especially if a company has a variety of makes and models of printers to source consumables for. Additionally, with Midshire, there is no need to spend time ordering toner, our OneStop software monitors each printer in your fleet and re-orders toner when levels fall below 25%, saving you both time, money and hassle. By installing software, such as PaperCut MF, companies are able to reduce their print waste by 15%! PaperCut MF allows management to enforce rules to the printer, ensuring that users are more responsible about their printing, helping you to meet your green therefore saving money. A Managed Print Service allows you to accurately budget for your printers. Rather than purchasing toner on a weekly or monthly basis, or paying for ad-hoc engineer calls and help-desk support, a MPS can be billed once a month or once a quarter, saving you from any unexpected payments. The billing process is charged based on the number of sheets of A4 or A3 paper printed during a set period, also known as ‘cost per copy’. Managed print software such as PaperCut MF or Equitrac allows business owners to have better control and visibility over their printing. The use of pin-codes or biometric (fingerprint) recognition means that users have to walk up to the printer to confirm their identity before they can release their print jobs. By giving users ownership of their account, managed print software reduces the risk of users printing the same document multiple times, or their job getting mixed up with another users printing, and then having to re—print. From restricting users to only being able to print in black & white and setting duplex (double sided) printing as standard, to removing the ability for users to print emails, PaperCut and Equitrac can drill down to both user and departments rules and monitoring. A Managed Print Service is built around you and your business needs. During your print audit, you will be asked to provide print volumes and additional requirements for each department and your business as a whole, to ensure that the printers you receive are the perfect fit for your company. With Midshire, you will receive a dedicated account manager as your direct point of contact. Your account manager will be with you for the duration of your contract, and will be able to answer any queries you have directly and efficiently. They will also be able to advise on any new technologies available to you, that you can access through the Midshire Group. With Midshire, when you sign up to our Managed Print Service, you will receive all engineer visits as part of your cost per click, whether it be an emergency call out or preventative or general maintenance. This means that you won’t be greeted with one-off charges for engineer visits, which is common for companies that don’t have their printer(s) on a MPS. Our team of highly skilled and experienced engineers will be on hand to visit your offices in order to service and maintain your devices. Midshire’s engineers are based regionally, so it’s likely that you will have the same engineer for the duration of your contract, meaning they will get to know you, your business and your printer well. If something were to go wrong, it is easy to arrange an engineer visit to keep your devices working as they should. Giving you complete peace of mind that your print solution and office printers are in safe hands. One of the main managed print services benefits is the consolidation of hardware. Before signing up to a MPS, most companies have a considerable number of desktop printers, large individual scanners and in some cases stand-alone fax machines all taking up valuable office space. An MPS allows these devices to be combined together, to just a few multifunctional devices at key locations throughout your business. By consolidating your devices, desk space will be freed up and floor space will be saved. With a Managed Print Service from Midshire, your toner is included in the monthly or quarterly payments, and you will agree a cost per copy click charge for both colour and mono and the size of the sheet of the paper, typically A4 and A3. One of the main managed print services benefits is our unique software. Our OneStop software monitors the toner levels on all customer machines and dispatches new ones when your cartridge is down to just 25%. Therefore, there is no need to stockpile toner ever again! You will only ever have toner on-site just before you run out. The day to day management and administration of a printer fleet can be confusing for the people responsible for the devices, especially when there are multiple brands and models. Most MPS providers will chose machines firstly based on requirements, and then ease for users. By installing a limited range of models from the same manufacturer, your employees can familiarise themselves with its interface and operation panel, greatly reducing user error. This means a comprehensive training programme is easy to deliver and your staff will quickly feel confident and comfortable with using your chosen equipment, allowing them to really get the best out of these often multifunctional devices. 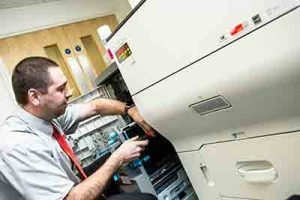 When you have an MPS provider looking after the complete smooth running of your printer fleet, your internal support staff will have to spend minimal time looking after your printers. OneStop software will automatically order toner for you and even take meter readings, so you don’t have to. The only time you need to speak to us is when you need to book an engineer visit, or if require further training for new users. We don’t always have to visit your office to repair your machine. Our internal IT support team can remote in to your printer via a secure connection and solve any network or scanning issues you may be experiencing, reducing unnecessary disruption to your office. With a Managed Print Service, your printers will be looked after by manufacture trained engineers. Just like serving a car, Midshire’s engineers proactively maintain your devices to ensure that they are optimised and running efficiently, reducing downtime and prolonging the lifespan of the equipment. This also saves money, as you will only need to upgrade your printer at the end of the contract. Once a machine is past its best and ready to be decommissioned, Midshire will wipe the hard-drive and properly recycle your printer in-line with government guidelines. Implementing an MPS should lead to reduced electricity consumption, reduced toner and paper usage and with the addition of a print management software it could even reduce your volume of printing. Additional sustainability benefits can be found if customers choose to adopt Midshire’s Toner Recycling Scheme. 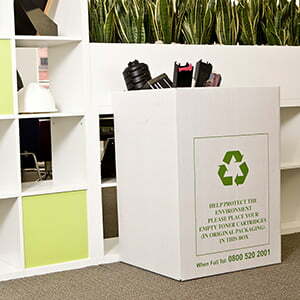 Midshire supports all of its customers in the handling of waste consumables, such as empty toner bottles, inks and cartridges, ensuring they meet the WEEE Directive guidelines for recycling.